Brief linkage today. While Homegrown Revolution doesn’t like to overdo the technology thing, we think this natural light collecting skylight device called the Suntracker One has promise. Similar in principle to the Solatube, the Suntracker, as the name implies, has an additional feature that the Solatube lacks — it tracks the sun with a built-in electronic brain and mirrors. Both the Solatube and the Suntracker direct the light down a tube, thus replacing the heinous blocks of fluorescent fixtures that typically light most commercial buildings with a more aesthetically pleasing natural light. Solatubes are available for residential use, but the Suntracker is oriented towards larger commercial applications. Using crap we had laying around the homestead, SurviveLA fashioned a solar cooker based on plans from Backwoods Home Magazine, the Dwell of the Ted Kaczynski set. We just substituted an old cooler for the cardboard boxes, and we finished it off by using one of Los Angeles’ ubiquitous abandoned car tires as a cradle to keep the cooker oriented towards the sun. It ain’t pretty but it works. In our first test we reached 160º inside the oven, but we think we can do better with some refinements such as finding a black pot with a lid. Yesterday we cooked up a somewhat disappointing batch of “chocolate pudding” which ended up with the consistency and taste of warm cake batter. We’ll test out some other recipes in the next few days, sun permitting, and keep you, our loyal readers, informed. For more information on solar cookers check out the superb Solar Cooking Archive. 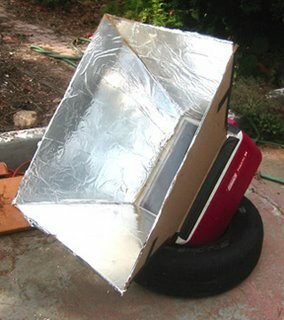 You can also purchase a commercially made solar oven called the Global Sun Oven, but why do that when you can make one with cardboard, aluminum foil, and a black pot? Your house should be like this National Park Service bathroom. Located on remote Santa Rosa Island, forty-six miles off the coast of Ventura, this handsome building features a solar water heater and a 12 volt electrical system to power the lights. Built of durable materials such as cedar and recycled plastic decking, this building should see many years of service. SurviveLA advocates the virtues of living small. Why not, for example, live in the Santa Rosa Island campground bathroom? The average American house has been super-sized to a gut busting 2,400 square feet and living in a structure the size of this bathroom would probably violate city codes in many places which mandate a minimum square footage for habitable dwellings. The nice thing about a small house is that it discourages the accumulation of crap and requires a lot less energy to maintain. Sure, there is less convenience with a building like this. With a very simple solar water heating system showers need to be taken at the end of the day and the very modest solar panel would not be able to power any major appliances. But these are minor sacrifices compared to the enormous benefits of self-sufficiency, namely one’s freedom. 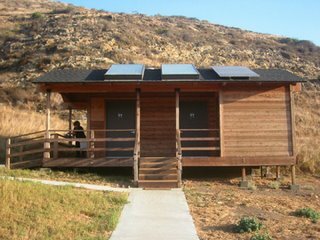 An aside here – SurviveLA encourages a trip out to beautiful Santa Rosa Island to enjoy the natural wonders and to visit this bathroom of the future. 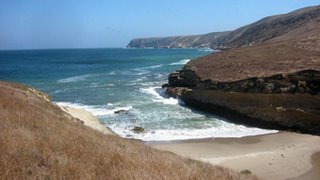 Unfortunately the vile and corrupt San Diego congressman Duncan Hunter wants to restrict access to the island so that fat cats can continue to go on $16,000 trophy hunts while drinking beer on the back of a truck. Read more about his plan to turn Santa Rosa into a retreat for disabled vets (an excuse to keep the fat cat hunt going) in the Washington Post. Please fax Hunter at this address ASAP and tell him that Santa Rosa Island belongs to the people, and should be run by the National Parks Service: Rep. Duncan Hunter, 2265 Rayburn HOB, Washington, DC 20515-0552. Fax is 202-225-0235. Let’s give Duncan the flush!